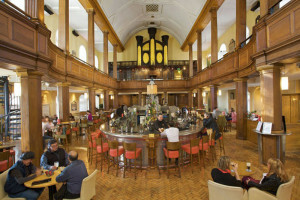 The Church Cafe Bar, Restaurant, and Club located at the corner of Mary Street and Jervis Street in Dublin. From Sundays to Thursdays, the venue is open from around 10:30am to 12 midnight. And on Fridays and Saturdays, the place opens at the same time but closes at around 2:30am. One of the most interesting aspects of this venue is the fact that it was previously a church. It has four floors and an outdoor terrace, and the various areas feature different kinds of entertainment and dining options for customers. When the owners of this place called it The Church, they weren't kidding. This place was used as a house of worship until deconsecrated in the 80's. The structure itself is really old, having been around since the 17th century, and it's seen some historic weddings. When the place transformed into a place for dining and dancing, the owners made sure to maintain a lot of the existing architectural and church-related features. Meaning that The Church Cafe Bar, Restaurant and Club feature stained glass windows, an old pipe organ, and an interior structure reminiscent of a place of religion. As its name suggests, this place has various areas, which cater to slightly different crowds. Whether you're looking for a good meal or a place to dance the night away, the Church Cafe Bar, Restaurant and Club will have something to interest you. The main area offers diners a more casual experience, a bar for cocktails that's open later during the weekends, and the fascinating sound of traditional Irish music performed live every Sunday. The gallery area located on a higher level, which allows diners to take in the beautiful sight of the interior spaces below and above. There is also a cellar bar and nightclub, which caters to those people who are looking to dance to music churned out by excellent DJ's in the Dublin area. Outside, the terrace offers a wide expanse where people can have something to eat along with some wine or coffee, all in a more relaxing atmosphere. Finally, there's a separate tower bar, which caters to groups looking for a more private function area. When you head for The Church Cafe Bar, Restaurant and Club, you already know that you'll be in for something special. Thanks to its interior décor and fascinating history, you'll already be experiencing something not found anywhere else. Who would have thought that this mix of past religion, present enjoyment, and great food could offer such a heady mix?